Suppose you are ready to start as a drone pilot. You have seen any drones, typically you may have seen many drones with four propellers, called Quadcopters. But recently, you may have been more complicated drones with complex frames that allows up to six propellers. Then, the question raises naturally, what is the difference or main advantages to purchase an hexacopter with a 6-propeller frame instead of a more classical quadcopter drone? Are there also some disadvantages to buy an hexacopter instead of a quadcopter? In short, we can say that you can find good points or advantages but also some drawbacks can be observed. It always depends on which feature you want to maximize more during your flight time, entertainment or work when you are flying your machine. The main advantages that can be observed would be related to the overall power. It is obvious that if you have six propellers instead of four, you have more power that translates into higher speed and elevation capability. Of course, it also depends on your flying skills. New comers would not fly up to high elevation or altitude and high speed is also strongly not recommended. A second feature would be related to safe flights. In case that something goes wrong, the additional engines provides support power that also translated into stability. In you have a lot of power you can transport and carry on with you heavier items, such as cameras for example. Professional photography works and movie producers using drones may find in hexacopter a better performance for their necessities. To conclude, with a hexacopter you have more control of your flight and variants in case of complex flight conditions. In addition, you have always high flight speed with six propellers. But not all can be pros when a comparison between quadcopters and hexacopters is performed. The negative aspects would be related the price, size and replacements. For example, an hexacopter frame tends to be larger, and needs six engines. Larger frames and more engines costs money. Therefore, the price becomes more expensive that simpler quadcopters. Because the frame is larger, and the weighter is heavier, it is more dangerous to fly it in small areas and if falling down can provide more damage. It is not definitely a drone for indoors or for your garden area only. The engines are more complex and the probability to have a problem might be larger because you have more parts and components. The replacements may also costs more. But if money is not the problem and you have a well prepared and determined area in which you can fly and perform your drone work safely, then you can only obtain benefits when flying and enjoying your hexacopter. This is really my favorite Hexacopter. 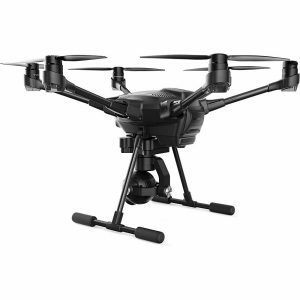 The Yuneec Typhoon H may not cheap if compared with others in the list, but you will see below that it incorporates a lot of technology that makes it very unique and innovative machine. See for example, the awards in innovation she was awarded and stunning Ultra 4K capability image and video, orbit me, point of interest and journey mode features among many others. EADY OUT OF THE BOX – Comes with ST16 all-in-one controller (7 inch Android touchscreen), CGO3+ 4K camera. The Typhoon H is ready to fly and record video and pictures out of the box, nothing else needed. SAFE TO FLY WITH BUILT-IN COLLISION AVOIDANCE – FAA compliant no-fly zone, 6 rotor safety with 5 rotor fail-safe, and ultrasonic collision prevention keep you safe. EASY TO FLY – GPS stabilized flight control, with 8 smart flight modes, automatic return to home, auto takeoff and auto land. No experience needed. COMPACT SIZE – Quick disconnect props for speedy removal, each rotor arm easily folds down from its flight position to a resting position against the drone for easy and compact transportation. The Typhoon H provides capabilities for enthusiasts previously only found in high-end professional drones, yet at a consumer price. With GPS stabilized flight control, 5 Rotor Fail-Safe, and 8 smart flight modes including auto takeoff and land, the Typhoon H requires no experience to fly. The 3-axis anti-vibration CGO3+ gimbal camera captures ultra- stable 4K Ultra High Definition video, vivid 12 megapixel still images and can be rotated through an unlimited, 360 degree range of motion. The CGO3+ gimbal camera features a high quality glass 98 degree field of view, wide-angle lens, and offers manual camera settings while in flight. Select a subject and Typhoon H will orbit that subject autonomously, all the time keeping the camera trained on the point of interest. Typhoon H will go up and out, as far as 150 ft, and capture the perfect aerial selfie. 1. WIFI FPV REAL TIME TRANSMISSION: The live video will be shown on your phone ,you can see what the camera see at the same time . Seeing the world and Taking the pictures, video of the scenery ,famaily in various angle. The pictures and video store in your phone ,it`s easy to share them with your friend. 2. COMPATIBLE WITH 3D VR HEADSET:“MJX FPV” APP is designed to accommodate VR 3D headset(not included). You can wear VR 3D headset to experience real flying feeling. Touch 3D mode button on the APP ,then wear the VR 3D headset ,you will go through an unbelievable visual fidelity and a whole new 3D visual effect. 3. THROTTLE ALTITUDE LIMITER: You can adjust the altitude limiter settings on the transmitter according to your preferences to prevent the drone from fly-away.Throttle limit mode designed for protecting the safety of the beginners. 4. HEADLESS AND ONE KEY RETURN: With headless mode, no need to adjust the position of aircraft before flying.And one key return mode avoid lost aircraft and bring drone back with the simple push of a button. 5. STABLE FLIGHT SYSTEM : With the latest 6-axis gyro flight control system, the drone will fly stably so that you can enjoy the easier flight ,taking clear photo and video. Adopting the 2.4Ghz radio control technology, ensure the powerful anti-interference capability. Headless mode help you take off: By using Headless, no need to adjust the position of aircraft before flying,the direction will be the same as your remote controller. Throttle limiter mode save your drone: With the help of throttle altitude limiter mode,it is easy to set the safe height,which will prevent the drone from fly-away. I selected this DJI F55 ATF Hexacopter kit frame because some people likes to “build” their dones. This kit, which includes engines, it is very suitable to customize your own hexacopter. for sale is a DIY HJ-F550 hexacopter kit , it is ATF (not ready to fly), this kit is very simple and stable, that it is very good for new starters, also suit for senior player to professional DIY. –Please be note this kit does not include remote control, flight controller and battery. 4. Skywalker V323: a huge hexacopter ! This Skywalker V323 Hexacopter is really large model. For those that like big hexacopters and drones with high stability, this can be your model. This makes a great gift for birthdays, holidays, graduations, or other times of celebration. The Skywalker V323 is perfect for aero enthusiasts and drone fans. Designed with simplicity and functionality in mind, it’s constructed with durable materials and ABS plastic to stabilize the Skywalker V323 while in flight. This helicopter has a 360 degrees range in motion. It’s powered by four six evenly distributed rotors and a 2.4Ghz 6-Axis (dual) controller. The controller has a digital screen to show battery life, channel strength, compass, and helicopter specifications. We recommend parental supervision when handling the Skywalker V323. This helicopter makes a great gift for birthdays, holidays, and other times of celebration.Product of AMG, Patneted and trademark of AMG Toys. Product size: 38.5*42.5*6cm. Charging time is about 90-120 minutes while flight duration is about 7-9 minutes. 4 channels function provide stable flying and easy operation. 6-axis gyro with posture control – Integrated design guarantee the precise positioning of the aircraft. Strong wind and drop resistence, easy to fly, stabile flight characteristics. If you are experiencing trouble pairing the controller with the drone: this issue could be fixed by simply moving the left joystick on the controller up and down so it registers correctly with the drone. It is advised that buyers should let the motor rest between 5-10 minutes between flight times to prevent it from overheating. Continuous usage of the drone without making time for rest causes the motor to burn out, therefore becoming defective. With Headless Mode,no need to adjust the position of aircraft before flying. With One Key Return function, makes it easily to find the way home. -Free switching between Right Hand Throttle and Left Hand Throttle. -With Headless Mode,no need to adjust the position of aircraft before flying. -With One Key Return function ,makes it easily to find the way home. -Quad-rotor design insures more stable and powerful performance easier. -Adopting 2.4G auto connection technology ,scores of quad-copter can be played at the same time. movements, stronger wind resistance, easier to control. -Full charged battery can support 8.5 minutes steady flight. This entry was posted in Hexacopter, Quadcopter and tagged Hexacopter Frame, Hexcacopters versus Quadcopters, Top 5 best Hexacopter Frame by qcopterpilot. Bookmark the permalink.